One person on Wednesday died after a one-storey building under construction allegedly belonging to the Lord’s Chosen Charismatic Movement in Asaba, the Delta state capital, collapsed. It was gathered that the collapsed building which is located on Rapu lane ,Asaba, was proposed to be the regional headquarters of the church. 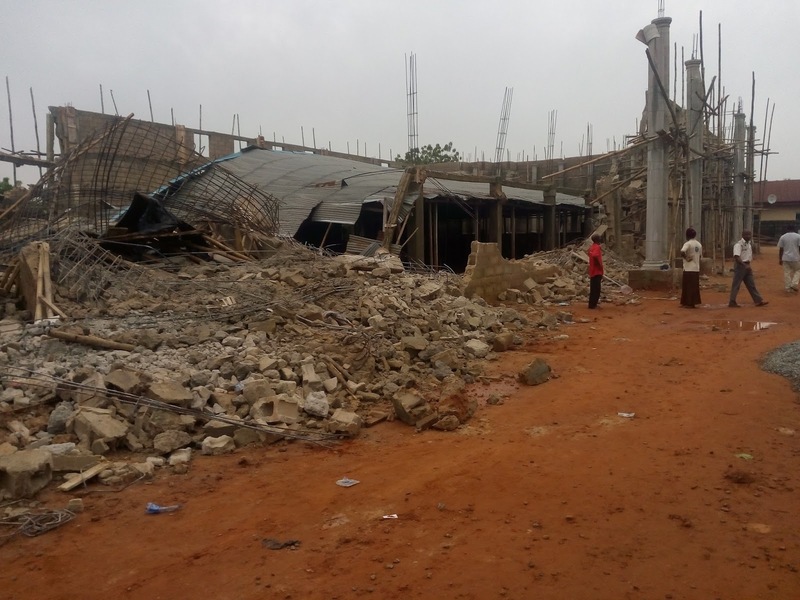 The Nation gathered that the superimposed uncompleted storey building crashed atop the smaller building, as worshippers held weekly church activities. When The Nation visited the scene, some residents who gathered at the scene of the incident attributed safety of members to God’s mercies. They wondered at the carnage had the building collapsed on Sunday when many members would have been in church. A senior pastor of the church, who spoke on condition of anonymity, said no life was lost but confirmed that about four persons who were working on the building sustained minor injuries. He said the injured persons were rushed to the hospital where they are receiving treatment while some were discharged after treatment. When asked of the possible reason for the for the collapsed of the building, he presiding pastor said “I am new in this place, I was posted here a few weeks ago, I met the building on ground, but from my observation, there are challenges which we are trying to handle”. He thanked God that no life was lost, adding that if the incident had happened on Sunday, it would have been a big disaster, but it was averted due to God’s intervention and mercy. The Nation gathered that the senior pastor and other top members of the church were invited by the police for questioning over the collapsed building but were allowed go after interrogation. Delta State Police Command image maker, Superintendent of Police (SP) Celestina Kalu, when contacted confirmed that one person died after five person were rescued from the ruins of the collapsed building. According to her, the senior pastor and the building engineer have been invited for questioning at the State Criminal Investigating Department ( SCID) of the command.